My beautiful friend, Jane Spigarelli passed away on Thursday after battling cancer for nearly three years. She was 45. She is survived by her husband, Chris Monte and their five-year-old son, Jimmy. I met Jane in the MFA programme at U.C. 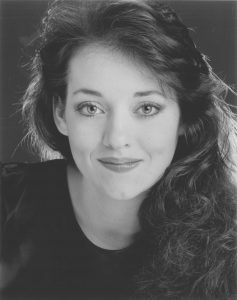 Irvine in 1988. Chris and Jane met in a little thing called Passion, Poison and Petrifaction, by George Bernard Shaw that I directed in L.A. after Jane and I graduated from UCI. I am so sad for Jane, for all the things she will not get to see, like her son growing up. I am heartbroken for her husband and her parents. I found this video clip of Jane on Google. I’m not sure when it was made, but it’s how I remember her when she was goofing around. Her natural singing voice was gorgeous. Last week my good friend and colleague Brigita was attacked on the subway going home and had to have stitches to her face. Luckily I don’t think the scar will be noticeable, but I felt sick to my stomach when I read her first email. This morning I received an email that my friend in Los Angeles passed away yesterday afternoon after battling cancer for almost three years. She was 45. She is survived by her husband (whom she met in a Shaw play I produced in L.A. in the early nineties) and their five-year-old son. I feel sad for her family and for her that she didn’t get to live a long life. Tears are ready to fall at every moment. I shared a house with her for four years, all through our graduate work, and through the Rodney King riots after we graduated. Her passing reminds me again of how precious life is and not to waste a moment of it. She will be missed by many. She touched the hearts of everyone who met her. She was beautiful and vibrant and passionate, and always ready to laugh. She was an amazingly talented actress who chose to use her ability to teach. She helped thousands of adults to learn English as a Second language.